We all know that Sparky grows up to be a trusted fire dog at Fire Station Number 5. 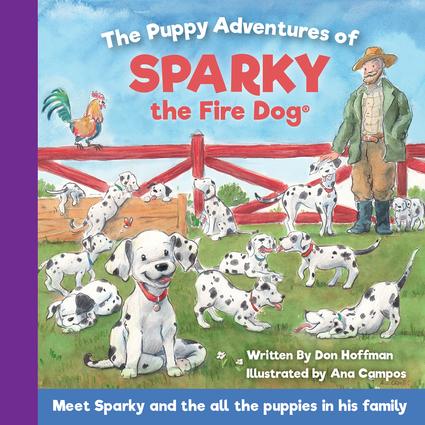 Now you can learn how Sparky was born on a farm as one of twelve puppies in a litter. All of the puppies loved the farm, but as they grew up they each found a home, a special job, and family of their own. Don Hoffman is an Emmy Award-winning children's book author and a Society of Children's Book Writers and Illustrators (SCBWI) fellow. His published stories reach back to 1999, with successful titles for leading publishers Charlesbridge/Imagine, Dalmatian Press and Popcorn Press. Learn more about Don Hoffman at donhoffmanauthor.com. Ana Campos studied Fine Arts in Granada and continued painting gardens, stone carving, making batik and etching until she discovered what she really liked is children's book illustration.